since a number of questions have come up about the CPU and the multiplier. While this Xeon D-1541 loaner is a pre-release BIOS on a pre-release Rev. 2.00 motherboard, I still thought it might be helpful to publish the results of the ever-helpful HWiNFO64. What we have here is the Supermicro SuperServer SYS-5028D-TN4T with the X10SDV-TLN4F motherboard, comparing the original Xeon D-1540 with the slight speed boost (<5%) Xeon D-1541, to reveal some other differences. Both system have default BIOS settings. Don't know if these power-use differences will be present in the released Xeon D-1541 on the final Rev. 2.00 motherboard. At this time, it does appear that the step-down of the CPU when idle all the way down to about 0.80GHz seems to have a different effect on each of the power use of each system. 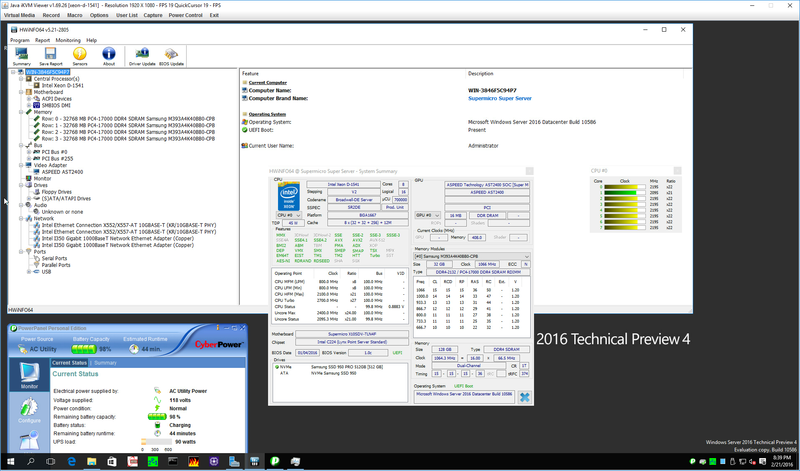 Both have the same 4 x 32GB DIMMs, and both have the same 1 Samsung 950 PRO 512GB NVMe SSD. Yes, I moved the DIMMs and the M.2 storage from one system to the next for these tests. To more easily compare the images, you may want to click on any image below, then use your left and right arrow keys to navigate among them. HWiNFO64 Xeon D-1540, system at idle. HWiNFO64 Xeon D-1541, system at idle. HWiNFO64 Xeon D-1540, system at full load [Prime95]. HWiNFO64 Xeon D-1541, system at full load [Prime95].